Friendship Force of Kansas Photo Album - see pictures of our last event in Wichita KS! 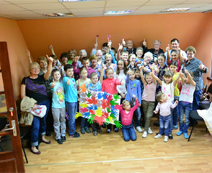 May 25, 2014 sixteen Friendship Force members arrived in Moscow. They were met by members of the Friendship Force of Korolev. Highlights of the first week were a visit to a Russian Orthodox monastery, a tour of the Moscow subway, visits to the Kremlin, Red Square, and the Tretyakov Gallery Art Museum. 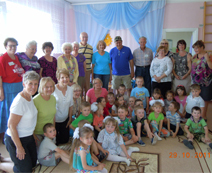 They also met some children who were learning English in the Kids English Club and were exposed to Russianfolk traditions and dancing. Most of the hosts spoke English; all were very warm and welcoming. 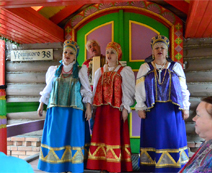 Saturday they boarded a train to Kotelnich and traveled through the night. 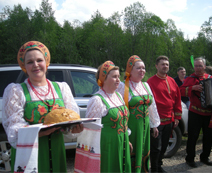 They then boarded a bus to Darovskoy.They were greeted by club members with accordion music, singing, and a maypole. Few of the hosts there spoke English. 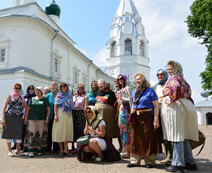 In the area a small Russian Orthodox church, a bird museum, dinosaur museum, and a historical museum were visited. At the historical museum they painted eggs in a Russian style. Through out the visit they were well fed with a great variety of foods. 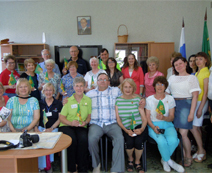 Some members extended their stay with a trip toSt. Petersburg where they toured Catherine's Palace, the Hermitage, Peterhof, the Peter and Paul fortress,and Alexander Nevsky's castle. While seeing historic places is wonderful, best of all is spending time getting to know people from other places and gaining a better understanding of their lives. Click here to see archived photos.